I'm tabling at the Grand Comics Festival this Saturday and Sunday, June 8th and 9th in Williamsburg, Brooklyn. Come check out my newest veteran comics stories! If you missed me at the Brooklyn Zine Fest, this is a great chance to get copies of the color veteran comics I printed in March. 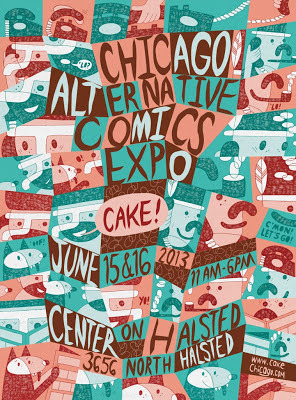 I'm tabling at the Chicago Alternative Comics Expo in two weeks, June 15th and 16th. It's my first time in Chicago, I'm looking forward to seeing all the incredibly talented comics creators there. I planned to debut Invisible Wounds, a 16 page story about an Iraq War Army veteran who is diagnosed with PTSD, but the debut has been pushed back to September for SPX. I will have brand new copies of Where Eden Once Stood, my new color collection of three veteran stories, and a small batch of the second printing of the popular mini comic, City Chickens.